Javier Baez is a player who transcends ordinary prospect-dom. Not just because he possesses extraordinary skills — also because he’s a prospect in whom fans of every team might be interested. Usually, a guy on the farm or a guy just on the roster will captivate locally, but Baez is able to captivate nationally, in a way that few young players are able. He’s not quite on the level of rookie Stephen Strasburg, for whose debut the whole country turned on TV, but people want to know what Baez is going to become. And they want to know how quickly he’s going to become it. His big swings are the hitter equivalent of Strasburg’s big fastballs. People who are interested in baseball are interested in Javier Baez. They know more about him than they know about the average young prospect. Keeping with the theme, other teams, too, seem to know more about Baez than they know about the average young prospect. Other teams have prepared for Javier Baez, just as we have as fans, and in the early going it turns out Javier Baez has been pitched pretty much exactly as you’d expect that Javier Baez would be pitched. Now Torres could do whatever he wanted, so why not go back to the well? Call it a cutter, call it a slider — Baez swung right through it, as he is wont to do to pitches. At this writing, he has two walks and twelve times as many strikeouts. He’s also slugging .517. About that: here’s a pitch and swing from the ninth. It’s telling that the catcher called for a low slider in the dirt. It’s telling that Baez destroyed the pitch that was ultimately thrown. It’s telling, how Baez has been approached through his first two weeks in the bigs. Baez’s extraordinary skill is his bat speed. That’s where the power comes from, and people who observe these things give Baez just about the highest of grades. Because of how quick his bat is, Baez should be able to turn on even blistering heat, but his swing his long and complicated in other ways so there’s a simultaneous belief that he could be vulnerable to fastballs in the right spots. People also question Baez’s discipline, as he might commit too early to pitches that end up unhittable. You’d think that, with a hitter like this, pitchers would be careful, and relatively unwilling to enter the zone unless forced. Now we’ll do some math. Including Monday’s game, Baez has faced 52% fastballs or cutters. 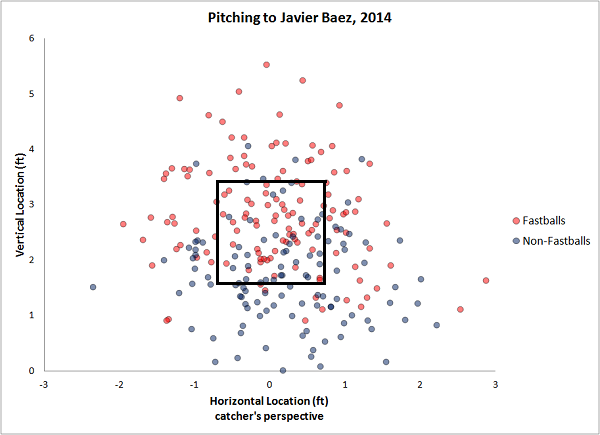 The league average is well north of 60%, so Baez is separated from the mean by a couple standard deviations. He’s surrounded by names like Wilin Rosario, Evan Gattis, and Juan Francisco. And, including Monday’s game, Baez has faced just under 40% pitches in the PITCHf/x strike zone. The league average is close to 50%, so Baez is separated from the mean by almost three standard deviations. He actually has the lowest zone rate in either league. That includes Josh Hamilton, Pedro Alvarez, and the utterly unprotected Giancarlo Stanton. This quickly, pitchers have adopted an extreme approach against Javier Baez. It’s one of the most extreme approaches in baseball, in terms of avoiding fastballs and avoiding the strike zone. He’s being pitched not unlike Hamilton, Alvarez, and Francisco, which means Baez arrived with a scouting report already written. It isn’t often rookies get treated like this right away. The point of comparison here would be to Bryce Harper. Immediately, Harper was pitched carefully, and he didn’t see a lot in the zone. Harper, obviously, was easy to see coming for years, so he had a reputation before he ever arrived. The same goes for Baez, although he and Harper have been pitched differently as rookies in ways more detailed than this overall glimpse. You might’ve expected Puig to get pitched like this when he first debuted, but instead against him pitchers were particularly fastball-happy. Pitchers have continued to try to find ways to consistently get him out, as Puig’s been able to make rapid adjustments. Plenty of fastballs up and beyond. Plenty of non-fastballs down and beyond. Non-fastballs are generally supposed to be down, but Baez sees a lot of them, and he has been exposed by high heat. Half his strikeouts have come against fastballs and half his strikeouts have come against breaking balls. He’s willing to chase up, and he’s willing to chase down, and that’s something he’s going to need to work on. But while he’s exhibited those weaknesses, he’s also exhibited an ability to crush well-intentioned pitches that don’t go where they wanted to. If you throw your high fastball, you can blow it by Baez. If you throw your low breaking ball, you can sneak it by Baez. If you don’t throw your high fastball high enough, though, or if you don’t throw your low breaking ball low enough, Baez is going to swing and he’s more likely to connect, and often when Baez connects, he connects in the way that meteorites connect with the surface of Earth. Pitchers are careful because they have to be careful. They have to be careful because Baez’s skills demand respect. Javier Baez has been in the major leagues for two weeks. Prior to the beginning of those two weeks, there already existed a Javier Baez opposing scouting report, and we’ve seen pitchers follow along, with varying degrees of success. The second half of that statement could apply to just about anyone, but what’s remarkable isn’t just that Baez arrived with a report — it’s that he arrived with a report so extreme in its recommendations. I suppose Javier Baez can be extreme in a number of ways. I suppose that might be the most appropriate thing. We hoped you liked reading How Pitchers are Pitching to Javier Baez by Jeff Sullivan! I hate to be Captain Obvious, but the reason those 5 guys aren’t getting fastballs in the zone is that pitchers don’t NEED to throw fastballs in the zone to get them out. They’ll swing at anything close and get themselves out. Yeah, if you miss there’s a price to pay, but still… The presence of AJ on this list backs up my claim. While not a power hitter like the others, he’s possibly the worst hacker in MLB. Pitchers aren’t stupid. If they can get a hitter out with pitches out of the zone, why do anything else? If Baez were smart (and I have my doubts), he’s spend a week or two just taking any pitches not right down Broadway. Then when word gets around and guys start throwing him fastball strikes again, look out! He could become a very dangerous man! Are you seriously posting this comment on Fangraphs? These types of responses are for Bleacher Report. Try and remember what website you are on. That being said lets look at this statistically. Odds are Baez is of average intelligence and has and average understanding of the game of baseball when compared to other MLB players. Have you ever heard him interviewed in Spanish? It’s like night and day. Same with his supposed “attitude.” When he speaks English, his whole demeanor appears subdued and wary. When he speaks in his own language, he’s animated and appears cheerful. And as for his approach? Stanton after first 10 MLB games: .231, 1 HR, 17 Ks. Baez after first 10 MLB games: .244, 4 HR, 17 Ks. He has struggled for a month or two after being promoted at every level since he was drafted in 2011. That’s why the Cubs brought him up early–so he could get his first two months out of the way before the 2015 starts. It’s you who doesn’t come across as the sharpest knife in the drawer. For a young kid he sounds fine during interviews. I cant imagine what I would have sounded like at age 21 in front of a bunch of reporters or on live tv being interviewed. I am not sure if plate discipline has been drummed into him. We are talking about a Vlad type of player, big swing, insane bat speed, and the ability to punish any pitch. What makes this kid special is not walking, or getting singles, it is the plus speed to leg out medicore contact, the plus plus power to turn anything into a homer. You may argue Vlad would have been better had he limited his strike zone, but he would have had to totally change his swing to do so, and likely would have lost the super elite bat speed that made him so special. You have your doubts that he is smart… Tell me, how many times have you scouted him in person before he came to the majors? You’re talking about the guy who has struggled at every step in the minors, then adjusts and destroys every level he has played in. That’s called being smart. A.J. Pierzynski, while annoying, commands a career batting avg. of .282, along with exceptionally low strikeout rates throughout his career. I hate to be Captain Obvious, but those players don’t get fastballs in the zone because they will crush them. Pitchers have no choice but to throw out of the zone. Both Hamilton and Alvarez have solid to excellent walk rates, as does Stanton. Pitchers won’t throw Baez crap over the middle if he draws four walks a game. That’s the life of a guy who can hit 50 home runs in a season, and that will never change. this is the thing that should be discussed in places like Fangraphs. we can talk sample size and rookie status and all that, but truly — even at his 62 PA sample size — his contact skills have been epic awful. i am a huge Cub fan and want nothing more than success here for Baez. but the list of guys why ever got to 1000 PA with a K rate of higher than 25% is very short. this is a list of all non-pitcher rookies with 50+ PA in the last 20 years sorted by K rate. Baez is 11th worst out of 1551 guys. he is 9th worst of 1025 in swinging strike rate. Baez is 12th worst in overall contact rate. he’s not just been bad at making contact. he’s been historically bad. this merits more discussion, imho. Because my comments were so blatantly misunderstood (my bad for expecting better), I’ll attempt to clarify. If you read my statement which you deem so offensive carefully, you will see that I was commenting in reference to his “baseball smarts”. And speaking to those, yes, I do have my doubts. Why? Because as many commenters below have pointed out, a 40% K rate combined with a 4% BB rate and a 65% contact rate don’t add up to a superstar – they add up to a sideshow attraction, LIKE Adam Dunn (although Dunn will take his walks to be sure), LIKE Dan Uggla, and LIKE Pedro Alvarez. Argue my original point though, which was that he gets himself out, so pitchers don’t need to throw him strikes. You can’t. It’s a fact. Contrast with Mike Trout. Yeah, he Ks a lot too, but he has the sense to K mostly on strikes. He makes the pitchers come to him, and he takes his share of BBs. And to those who say that Baez can hit a ball 2 feet outside out of the yard like Vlad, so what? As a pitcher I’ll take my chances on that all night long. So he hits one out of 200 out, big deal. It beats throwing him a strike and having him hit one out of 20 out. My point is that IF he’d be a little disciplined, he has the raw ability to BE another Mike Trout. And who would you rather be, Mike Trout or Dan Uggla? Not all players have the same set of abilities… He can strike out a lot like most sluggers do. He’s young enough to learn and adapt. If he comes out as a middle infielder with 30HRs .260Avg, I think he’ll make a lot of money and no one will be talking about his “baseball smarts” whatever that means.